1990 saw the end of one era and the beginning of another. Liverpool’s reign at the top of English football was coming to an end. Manchester United’s was just about to start. You can definitely chart where Liverpool end and United begin, and the club which stitched it all together? The two most successful clubs in English football are Liverpool and Manchester United. Between 1976 and 2009 the two won 21 of 34 league titles, Liverpool (10) Manchester United (11). Only three of these seasons did neither side finish in the top two. 1980-81 was the only season when neither side were in the top three. Such was their dominance. In contrast to other countries dominated by two big clubs, the two never traded blows with titles. The two clubs’ periods of dominance have a clear beginning and an ending. During Liverpool’s period of dominance, United finished second twice and third three times. In United’s period, Liverpool were second twice and third five times. There has never been a period where one club won the title one year and the other, the next. This article highlights a time when control passed from one to the other. Although it wasn’t necessarily seamless, but you could point to two games towards the end of the 1989-1990 season when there was a definite power shift. You can chart Liverpool’s rise to dominance of English football from Bob Paisley’s first title in 1976. They’d won the title three years earlier, Shankly’s third and final championship, but this was in a period of seven different winners in nine years. A year later they became the first side since Wolves, 17 years earlier, to defend their title, such was the competitive nature of English club football. Paisley stepped down in 1983 having won six titles in eight years. But such was the strength of the club, his successor, Joe Fagan, immediately won the title in his first season completing a club hat-trick. Fagan had been Paisley’s coach as Paisley had been Shankly’s. It was a seamless transition. Fagan stepped down after two seasons unable to stop Everton picking up the title in his second year, but then Kenny Dalglish took on the role of player-manager and won the double in his first season. The Everton championship win was significant. No other club during this period had managed to sustain a challenge to Liverpool’s dominance until Howard Kendall’s Everton won two championships in 1985 and 1987. The latter forcing the Anfield board to back their manager with funds to purchase Barnes, Beardsley and Aldridge and thereby extend Liverpool’s dominance. By 1988 Everton’s challenge had faltered and so emerged George Graham’s Arsenal. As Everton had traded titles with Liverpool in the mid-eighties, so Arsenal did at the turn of the decade. Liverpool’s 18th championship in 1990 was emphatic. They won the league by nine points. They clinched the title at Anfield against QPR with still two matches to play. Crisis, what crisis? But the cracks were beginning to show. The squad was aging. Captained by Hansen with Rush, Whelan and Grobbelaar still influential having come into the side at the start of the eighties. The young players coming through weren’t quite as good as those they replaced. The likes of Hysen, Venison and Rosenthal were good but were unlikely to have got into the great sides ten years earlier. At the end of the season a buoyant Hansen explained sometimes they got bored, sometimes winning was too easy. Whether this was bravado, arrogance or over-confidence they would never find it easy again. The Liverpool side of 1987-1989 was one of the best English football had ever seen. By 1991 they were unrecognisable from that. Where the baton was passed from Liverpool to Manchester United was in the FA Cup. Liverpool began the season with a thumping 9-0 win at home to Crystal Palace. It was champagne football with eight different goalscorers, including John Aldridge. He came on for Beardsley and ran straight to the spot to score a penalty for the sixth goal. Aldridge was making his final appearance at his boyhood club before moving to Spain. Liverpool were relentless and Palace powerless to stop them. They would have their revenge. Liverpool then hit eight in a FA Cup Third Round replay at Anfield against Swansea City. They needed replays to get past Norwich and QPR and were into yet another semi-final, where they would meet Crystal Palace. Palace had beaten Portsmouth, Huddersfield Town, Rochdale and Cambridge United to reach their first semi-final since 1976. The semi-final at Villa Park was a pulsating affair. Rush gave Liverpool a first-half lead but Palace came back to lead 2-1. When John Barnes converted a penalty seven minutes from time Liverpool were now in front, 3-2. Chasing their second double they were expected to see the game out. But Palace weren’t giving up and Andy Gray managed to head past three players on the line to equalise with barely two minutes remaining to take the game into extra time. Four minutes into the second period Alan Pardew headed in from a corner and Palace had pulled off a famous victory in dramatic circumstances. They were into their first ever FA Cup Final. Meanwhile, in the league, they were battling the drop, just seven points clear of Luton Town. But immediately below them were Manchester United with justfive-pointint cushion from relegation. All was not right at Old Trafford. The eighties had not been kind to Manchester United. Still searching for that elusive title, they had spent big to try and bring the glory days back. But all they had to show for it was two FA Cups in 1983 and 1985. In November 1986 they appointed former Aberdeen boss Alex Ferguson. Ferguson had successfully broken the old firm stranglehold in Scottish football and the United board believed he was the ideal man to wrestle control of English football from Merseyside. They finished 11th in his first season then 2nd and 11th. Languishing in the wrong half of the table during the 1989-90 was testing the board’s patience. There was talk of them considering pushing the button for the next candidate. By Christmas, some fans had lost patience with the manager. Legend has it that Mark Robins’ goal in the Third Round at Nottingham Forest saved Ferguson’s bacon. Clayton Blackmore may well have done the same thing when they struggled past Fourth Division Hereford United in the next round. Whether this is true or not is unclear, but it is fairly certain had Ferguson not delivered a trophy at the end of the 1989-90 season, he would’ve been gone. The season hadn’t started well with Michael Knighton making an attempt to buy the club. His appearance on the pitch doing keepie-uppies before the opening game of the season seemed more in keeping with the razzmatazz Stateside than Old Trafford. In the end, he didn’t have the money he said he had, yet this seemed to be the catalyst for a season of disappointments. After the Third Round win at Forest, they suffered back-to-back defeats at home to Derby and away to Norwich. The Norwich defeat saw them slip to 17th. Just one place above the relegation zone. They needed a replay to get past Oldham Athletic in the semi-final and so they had an FA Cup Final to look forward to. As overwhelming favourites, they couldn’t afford any slip-ups. 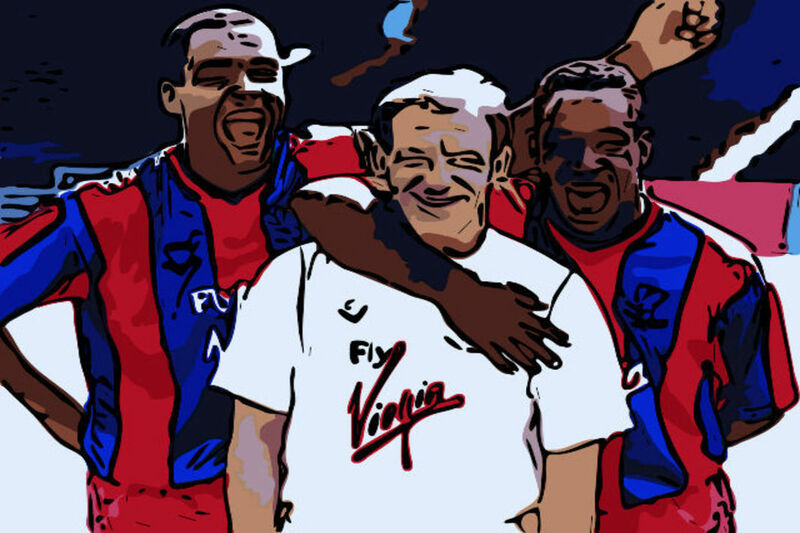 The Final had some added spice in that Palace were managed by former United player Steve Coppell. Palace had also won at Old Trafford in December, coming from a goal down. 12th May 1990 and two minutes into extra time Ian Wright volleys Crystal Palace into the lead. Wright had equalised for Palace two minutes after coming on as a second half substitute. Now as the game went into a further 30 minutes he volleyed in John Salako’s far post cross. Palace were the underdogs, on account of this being their first ever cup final appearance. The two had ended the season level on points but in the wrong half of the table, just five points above the dreaded drop zone. United’s pedigree and standing in the game was what made them favourites. That and the fact they had established internationals such as Bryan Robson, Mark Hughes, Neil Webb, Brian McClair and Jim Leighton. Palace held the lead until six minutes to go when Mark Hughes scored his second of the game to equalise. It was a frantic finish to the game, but right at the end, Mark Bright headed against the post from a Geoff Thomas corner. Had Palace held on after Wright’s second or had Bright’s late header gone in then United would’ve lost. There is little doubt Ferguson would then have been sacked and the whole course of football history from then on would’ve been completely different. As it was the Final went to a replay the following Thursday. Lee Martin scored the only goal of the game and United lifted the cup for the seventh time in their history. Ferguson’s job was safe. They won the European Cup-Winners’ Cup the following season and then pushed Leeds United close to the title the year after. 1992-93 saw United end their 25-year wait for another league title. The rest, as they say, is history. For Liverpool, the start of the following season saw them win their first eight league games. They didn’t taste defeat until Arsenal beat them at the start of December. 14 games unbeaten was quite a start but Arsenal themselves were unbeaten and that victory found them just two points behind. It would be February before Arsenal lost in the league, at Chelsea. 24 hours later a goal on his debut from David Speedie earned Liverpool a point at Old Trafford. Arsenal and Liverpool were separated only by goal difference at the top of the table. Speedie scored again in his next outing and earned a certain cult status at Anfield when his two goals saw them win the Merseyside derby. But Speedie was one of two signings Dalglish made in quick succession. Jimmy Carter from Millwall was the other. Neither were good enough, especially Carter. Speedie scored goals wherever he went and Dalglish was a fan of his. In fact, Speedie has revealed Dalglish tried to sign him twice before. The two ended up at Blackburn together too. The next fixture for Liverpool was another derby with Everton, this time in the FA Cup. The game at Anfield ended goalless and the replay was scheduled for three days later. It went down in the history of derbies and FA Cup matches as the two slugged it out for a 4-4 draw. It really was a slug-fest as Liverpool lead four times and each time Everton equalised, with the final goal coming deep into extra time. Within days Kenny Dalglish had resigned as Liverpool manager. The club and all of football was shocked. Coach Ronnie Moran was installed as caretaker manager. They lost their first three games under him, including the second FA Cup replay and importantly, the game at home to Arsenal. Arsenal now had a clear lead at the top. Liverpool recovered and an emphatic 7-1 win at Derby put them back on top. But defeats at home to QPR, then at Southampton, Chelsea and Nottingham Forest handed the title to Arsenal by eight points. Having lost just twice in 24 while Dalglish was in charge, Liverpool lost six of their last 14 and finished second. It would be 11 years before they’d reach those heights again. Liverpool are currently pushing for the league title. The improvements United have made since dispensing with Mourinho’s services would give them hope of challenging next season. Could we see a ding-dong battle between the two biggest clubs in England again?